June 19th marks the much anticipated launch of the Good Capital Project. Its kick-off event is sure to attract senior-level attendees and heightened media attention for impact investing collaboration. Here’s what you need to know about the Good Capital Project before you go. It is the first initiative of SOCAP’s new owners — a group of impact investors led by Robert J. Caruso of Kantian Social Ventures. SOCAP announced the move from former owners MissionHUB LLC last March. Its press release points to the ability of new ownership to “allow SOCAP to independently ramp up its efforts to spread awareness of market based solutions to the world’s greatest challenges, curate thought-leadership in the space, and educate impact market participants” as reasons for the move, as well as to continue to expand to mainstream audiences. SOCAP’s new-look comes as it celebrates its 10th anniversary, and its leaders — both old and new — agree that now is the right time for a change. In a NextBillion interview, Kevin Jones — a SOCAP Founder — described the move as an integral step in evolving impact investment from an emerging industry into mainstream practice. Jones explained how at SOCAP’s beginning, “three different billionaires ordered us out of their offices.” No one believed in SOCAP’s core premise — that investing for financial returns and social impact are not mutually exclusive. Jones was undaunted. To overcome this “two pocket” way of thinking, SOCAP began to build a market through its Mideast bazaar-style conference that welcomes all groups to the table to share ideas. SOCAP’s open conference format proved successful. The annual flagship event in San Francisco, the world’s largest impact investing conference, is considered the go-to forum for impact investors, social entrepreneurs, foundations, corporations, global nonprofits, and anyone else interested in socially, environmentally and economically sustainable solutions. While SOCAP makes a point of its commitment to inclusiveness of all impact stakeholders, certainly one of its greatest assets is the caliber of impact leaders it attracts. 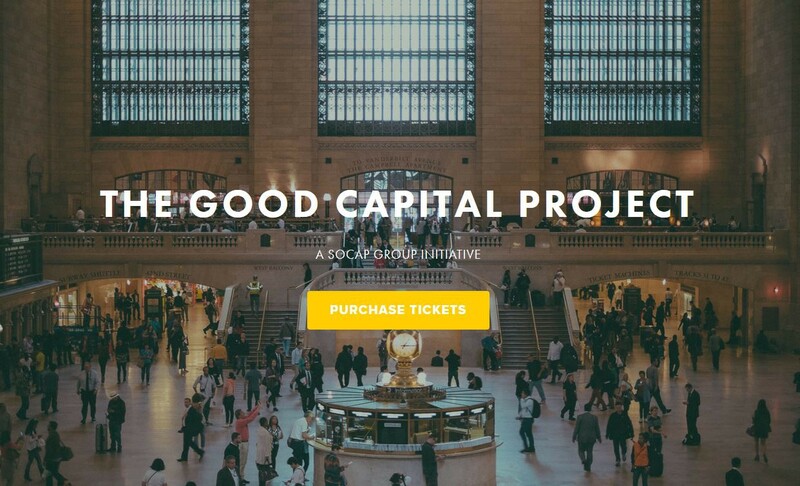 Leading up to the launch of the Good Capital Project, SOCAP is posting a series of interviews with impact leaders about why the Good Capital Project is needed now. Contributors include such well-respected leaders in the space as Jim Sorenson, Chairman of the Sorenson Impact Foundation; John Kohler, Executive Fellow and Sr. Director of Impact Capital at Miller Center for Social Entrepreneurship; and Gloria Nelund, Co-founder, Chairman, and CEO of TriLinc Global. What led you to become involved in The Good Capital Project? What are you most excited about? Why is collaboration in this industry so important? What are the biggest challenges facing the space? What do you see as the biggest opportunities? What would you most like to see come out of The Good Capital Project? These posts are worth a quick read to prepare you for what’s sure to be an enormous amount of information to process in ten quick hours. Start with Kevin Jones’ conversational and uncensored overview of all things impact investing. Alternatively, this May blog post highlights the top five reasons to attend the launch and pulls quotes from each of the lead-up interviews. The ambitions agenda enforces that this will not be a passive experience for attendees. It focuses around six “Grand Challenges”. Each challenge is assigned a group of category experts who will help set the framework for the breakout design sessions. Each working group will have a facilitator to guide them through the creative process. How can we better explain the importance and necessity of such investments? How can we map the impact investing ecosystem, and the processes we currently use, in order to improve and streamline them? How do we develop better educational tools to educate and inspire those who seek additional knowledge? Understanding the risk return spectrum of impact investment opportunities is extremely important. While there is much recent focus on “market-based” returns, we cannot lose sight that there must also be room for the deeply intentional investments that are not profit maximizing. Investable Solutions will provide clarity between investment opportunities that are and are not concessionary. This track will address some of the following questions: Which sectors are ready for market rate returns and where are subsidies needed to catalyze the market? What can we learn from what’s working already, and what’s starting to work? Innovation is the engine that drives change, spurs growth, creates social impact and jobs, and propagates new ways of thinking. Entrepreneurs are the ones that launch the disruptive innovations that scale, but the impact landscape is inefficient and fragmented, with a conflicting mix of investor demands. Now, tools and approaches are emerging that need rapid replication to increase the volume of high quality deal flow. Jason Rosado, President and CEO, Givkwik, Inc. While big advances are being made in metrics for social and environmental impact and sustainability, many of these impact metrics are often redundant, confusing and in conflict. This is a costly and distracting problem for both investors and entrepreneurs running their companies. How can we create a Rosetta Stone that overcomes the fragmented, siloed approach and ensures the right things are being measured? What are the organizational legal structures and investment vehicles that are needed? What policies and regulatory changes would unleash growth, and how can we imagine and garner the support needed? How can policy bring new participants to the table who have been excluded? The impact pioneers have proven that sustainable and stakeholder-focused companies can also achieve market rate risk & return profiles. What are the barriers to replicating those successful models at scale? How do we learn from the traditional asset managers who have long mastered the ability to launch a product that fits nicely on the shelves of bank or brokerage firms to be seamlessly delivered to the end consumer? Tim Freundlich, President, Impact Assets Inc. The day will kick off with several introduction and information sharing sessions. Then attendees will choose a Grand Challenge working group and dive deeper into the associated issues. During the course of the day, key players in the impact space will share their views in a series of “Good Capital Insight” talks. In the final plenary session, Grand Challenge teams will present their findings, including framing of the challenges, strategies, and solutions. They will announce their plans for how to implement the evaluation, scoping and budgeting of the grand challenge over the next two years, including timelines for next steps and milestones. The group will reconvene as a whole at SOCAP17 to measure progress and plan next steps. We look forward to following the Good Capital Project launch next week! Follow along with us @StartingUpGood. Where are the sweet spots for startups and impact investors to join forces? Where are the sweet spots for startups & impact investment? We explore this evolving space & share what we find.